When I was a kid, the easiest way to make summer money even if you were below the age for getting a “real” job was to caddy at the Blue Hills Country Club. The older kids obviously got the good caddying assignments which brought in good money through standard wages and tips, while the younger kids below high school age made a pittance by shagging balls at the driving range, or carrying the women’s Sunday bags. Once each summer a day was set aside as “Caddy Day”, and we got to play a round of golf on the 18 hole course. I was not a good golfer, still am not, so I just enjoyed the fun of playing without the pressure of having to do what it took to win,and the idea that I had earned the privilege to use the course. Among the group I usually played with, a collection of neighborhood friends, we had one kid who was more serious than anyone else in the group, more serious than those who were just as good at the game as he was, and someone for whom winning was everything. One “Caddy Day” on the last hole the scores of the other kids in the party were decent and pretty close, while mine was predictably horrendous, and it had come down to the final putt of a friend, I will call him Tom, to determine if he would be the big winner, something he was serious about, something he could taste. On what was to be, in his mind anyway, his final putt, the ball slowly rolled toward the hole, and when it reached it, the ball circled around the rim. However, instead of giving in to gravity and falling into the cup, the ball kissed the lip so tightly that it finally settled right on it without going in. This meant Tom was in second place, not first, and this he just could not, and would not accept. He was supposed to win. He announced that technically the ball should be considered to have gone into the hole since it appeared that at one moment in its orbit it had actually gone below the rim, and this being the case, it was a “Gimme Putt”, which made him the winner. When the rest of us did not accept this, he threw his putter, and kept screaming it was a “Gimme Putt”, as he stormed off the course. He just could not accept his loss. He was supposed to have won. It was a funny moment that has stuck with me, and one that comes to mind whenever someone who loses what he thought was a guaranteed win, is totally unable to accept that it was not, and who rails against nature and the cosmos itself for things not turning out the way that had been expected. It is the image of a true spoil-sport. 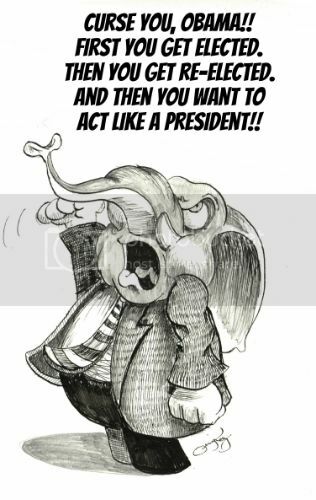 The GOP resented that Obama was elected president in the first place, and never got over it. They did what they could to make his first four years a failure so that the voters would reject him the second time around. They failed to make him a one term president, and in 2012 the GOP was shocked that their boy did not get elected, and that shock was nowhere better illustrated than by Karl Rove realizing the reality of that on Fox News the night the election results came in. In an attempt to finally have things go their way, they are obviously the poorest of sports and cannot accept defeat. They need some way to be given that “Gimme Putt”. So, forty-three House Republicans are sponsoring a bill that would force the House to sue President Obama for behaving like a president should, and the way previous presidents, including GOP ones had. Those forty-three Republicans object to President Obama having said in his State of the Union address that he would enact policies if Congress didn’t act. The “Stop This Overreaching Presidency (STOP)” measure was introduced by Rep. Tom Rice (S.C.), and has 104 co-sponsors, including Senate GOP hopeful Reps. Jack Kingston (Ga.), James Lankford (Okla.), Steve Stockman (Texas), Paul Broun (Ga.), Steve Daines (Mont.) and Phil Gingrey (Ga.). They are angry that he delayed the employer mandate in the ACA, implemented the DREAM Act for the executive branch, let people keep their substandard health insurance policies, and ended work requirements for welfare recipients. Republicans had demanded the extension of the substandard health insurance while they made a big thing about people losing health insurance plans that they liked. So it is odd they are finding fault with getting what they wanted, and courts have ruled for decades that presidents have the constitutional power to delay the implementation of a law. Rather than end work requirements for welfare recipients, President Obama gave states the option of ending the requirements if they chose to do so. Don’t many republicans, especially the Southern ones including Oklahoma and Texas constantly demand the respecting of “states’ rights”? Obama’s executive orders only cover the executive branch, and he didn’t implement the DREAM Act for all of the country, just for the executive branch. These House Republicans want to sue the president for exercising constitutionally granted powers, while claiming to be the great defenders of the Constitution. I guess only those parts they like, though. What obviously galls them is that the president has decided to work around the GOP’s endless obstructions instead of having things stopped by them. The GOP has no agenda, beyond these obstructions, so to lose that must really hurt. So they are hoping the courts, you know, those activist judges and courts who push their weight around and are the bad guys when they do not rule the way the Republicans want them to, will rule that the president cannot be presidential. And, to show how off the wall this is, it is an idea that Michelle Bachmann has wanted for a long time, even before the “reasons” were found. It was an idea searching for a reason to justify it. It’s a “Gimme Putt”, a desperate attempt to finally get their way.